Afternoon tea is the perfect summer weekend activity – Providing an opportunity to catch up with friends, try a new restaurant and perhaps most importantly, stuff your face with cake and other goodies! 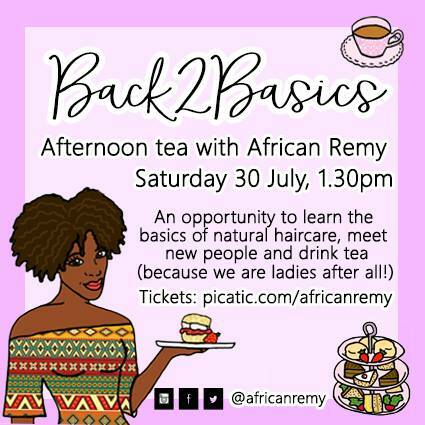 Africanremy.com will be hosting a special afternoon tea with an afro hair twist. Not only will attendees be able to enjoy a wonderfully scrumptious afternoon tea, but they will also be able to take part in interactive and informative sessions on curly/afro hair care and all within the magnificent setting of the prestigious Barrister’s Court private dining room at Brown’s Covent Garden brassiere. Sessions will cover the basics of curly/afro hair care, dispel some hair care myths and explain what different product ingredients do and whether we want them or want to avoid them. Though aimed at people those with curly/afro hair or an interest in, all are welcome and healthy hair care advice will be largely applicable to all hair types. So come along, meet some new people and share your hints, tips and woes with some lovely ladies.